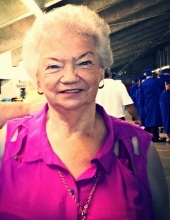 Wanda G. Wills, 76, of Dawson, peacefully passed away on April 6, 2019 surrounded by her family after several years of courageously battling various illnesses. She worked for years as a waitress and later a housewife, lovingly taking care of her mother and family. She loved to joke and had nicknames for all her close friends and family. Every day spent with her was full of laughter. She loved sitting on her front porch enjoying her flowers and birds, her grandchildren were the light of her life. She was preceded in death by her parents, W.D. and Bessie Lackey Stone; siblings Earl Raymond Stone, Viola Gordon, Clarence Stone, Alonzo Stone, Geraldine Balog, Louetta Sears, Shirley Rhodes Simms, Mary Francis Reeves, and Franklin Stone. She leaves behind her loving husband of 42 years, Jesse B. Wills; one son, Sean Davies (Missy Austin); one daughter, Kelly Hamrick (Nathan); three grandchildren, Taylor Davies, Nicholas Davies (Chevelle Brooks); and Mikayla Davies (Eric Allen); dear friend and sister-in-law Connie Midkiff and a special “grandniece”, Sophia Midkiff; all also of Dawson; one sister, Vivian Wyatt of Mentor, OH and a large extended family and many friends who meant the world to her. She will be sorely missed by her loyal “fur babies”, Roxie and Suzi, who never left her side. A memorial service will be held at the Rainelle Kingdom Hall of Jehovah’s Witnesses, located at 781 James River and Kanawha Turnpike, Rainelle, WV on Saturday, April 13, 2019 at 1 p.m. with Howard Shaffer officiating. A Celebration of Life for family and close friends will be held at 2 p.m. on Saturday, May 11, 2019 at the Cadle Farm in Grassy Meadows, WV. To send flowers or a remembrance gift to the family of Wanda Gaye Wills, please visit our Tribute Store. "Email Address" would like to share the life celebration of Wanda Gaye Wills. Click on the "link" to go to share a favorite memory or leave a condolence message for the family.